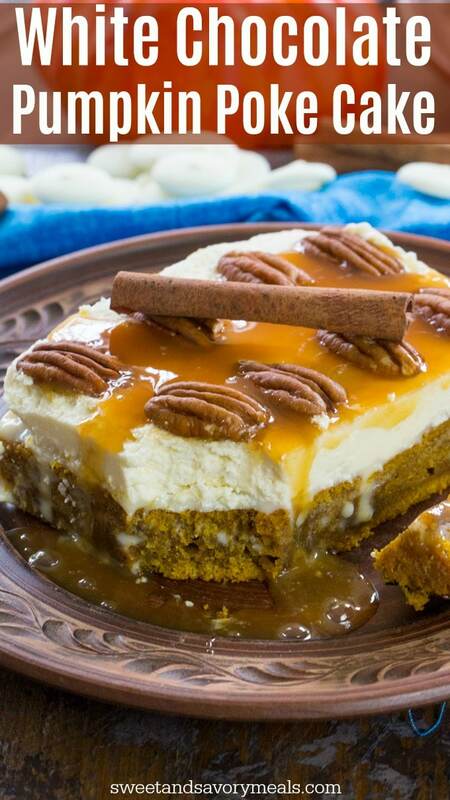 Pumpkin Poke Cake is deliciously infused with a sweet white chocolate sauce, topped with cream cheese frosting, caramel and crunchy pecans. 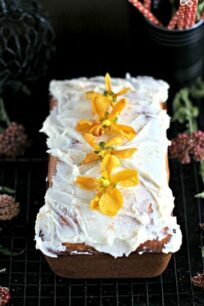 Poke Cakes are very popular on the blog, because they are so easy to make, look stunning and taste delicious. Having already so many tasty poke cakes, like this Strawberry Poke Cake, German Chocolate Poke Cake and Baileys Poke Cake, it only made sense to add a pumpkin one to the collection. Pumpkin Poke Cake is my way of taming a pumpkin craving. This cake is so easy to make, a foolproof recipe that is very hard to mess up. The aromatic pumpkin cake is poked, poked, poked and all those tiny holes filled with a white chocolate sauce. Obviously, I couldn’t leave out the cream cheese, and topped the cake with a cream cheese frosting. A drizzle of caramel and crunchy pecans finish the cake beautifully. Using a cake mix will reduce the prep time. You can use Yellow Cake mix or White Cake mix. Let the chill for at least 8 hours in the fridge before serving, this will make the cake extra tender. Keep the cake refrigerated as the frosting will soften if kept at room temperature for too long. 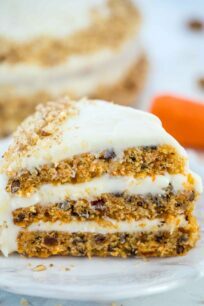 For more texture, you can add one cup of chopped pecans or walnuts into the cake. You can either pipe the frosting on top of the cake, or just spread it evenly with a spatula. 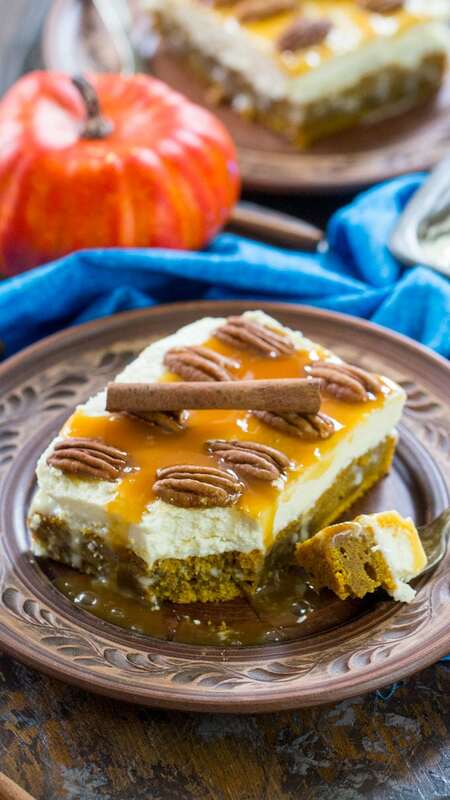 How to freeze the Pumpkin Poke Cake? In a large bowl, whisk together the dry ingredients: flour, sugar, baking powder, pumpkin spice and cinnamon. In another medium bowl, whisk together wet ingredients: eggs, oil and pumpkin, until well combined. Add wet ingredients to dry ingredients and whisk until smooth and the batter has no lumps. You can use a hand mixer. Transfer to prepared baking dish and bake for 35-40 min, or until a toothpick inserted in the center comes out clean. Remove cake from pan and immediately poke with a straw all over the surface. In a medium, microwave safe bowl, combine white chocolate chips and sweetened condensed milk. Heat in the microwave until hot for about 1 minute, stir and heat 30 seconds or more if needed. Stir until fully combined, smooth and shiny. Stir well as the chocolate will melt from the residual heat from the condensed milk. Pour the chocolate mixture all over the cake and using a spatula spread it evenly into the holes. Let the cake cool completely before topping with frosting. Combine all the frosting ingredients in the bowl of a stand mixer and using the whisk attachment, beat on medium speed until combined, then beat on high speed 2-3 min or until fluffy, stopping and scraping down the bowl as needed. Top the cake with frosting. Level it with a spatula. 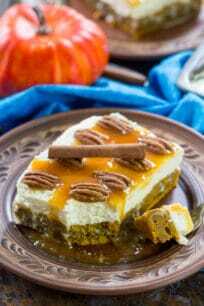 Drizzle with caramel sauce and top with pecans. Refrigerate the cake best for 8 hours before serving. 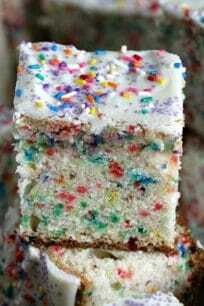 I have yet to make a poke cake but this one looks fantastic and really wants me to try my hand at making one. You are queen of the poke cakes! Definitely adding this to our poke cake collection! I’ve never made a poke cake before, but this might have to be the first one I try… It looks so yummy!! What an amazing Fall cake! 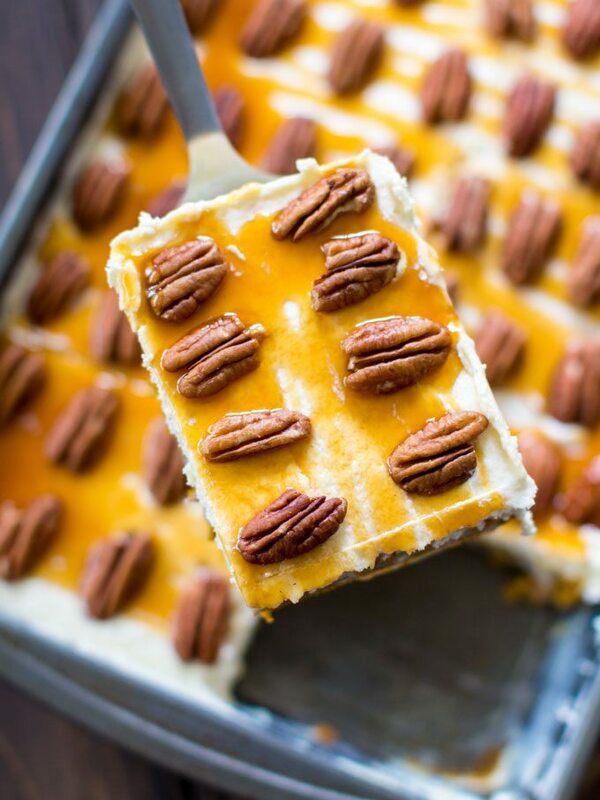 Love those pecans on top! I love poke cakes! They’re packed with so much goodness and flavor! Love how easy this is! It’s the perfect fall dessert! Swoon. This seriously looks INCREDIBLE, and I can’t believe how simple it is! Pinning now! The contrast of the layers and textures of this cake makes this a very interesting recipe. Cake, cream frosting, caramel sauce and crunchy nuts definitely go well together for the season and not forgetting the combination of great flavors too.